The Town of Nags Head will be conducting a beach nourishment project starting May 2019 and lasting possibly through the fall of that year. Plans call for sand to be placed on 10 miles of beach from the Bonnett Street public beach access at 2919 S. Virginia Dare Trail (near Mile Post 11) south to the town line with the National Park Service (near Mile Post 21). Sand will be pumped onto the shoreline by offshore dredges to widen the existing beaches, which have suffered from erosion in many places. The goal of these beach nourishment projects is to replenish and protect the homes and beaches we all love, from coastal storms that threaten our shoreline. This project will be completed in sections to minimize the impact on visitors to the area and ensure that the beaches are still accessible for your enjoyment. 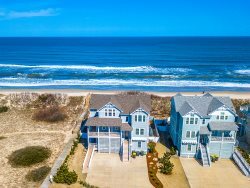 Nags Head does not expect to have a schedule for the project until late April 2019 and even then the schedule will likely change often as weather conditions and other issue arise. More than one section of the beach could be impacted during the project and the project progression will likely not be linear, meaning that it won't start at one end of town and proceed to the other end.